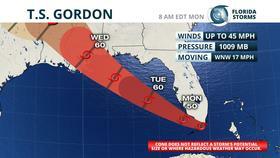 Tropical Storm Gordon formed Monday morning near Key Largo, Florida and is expected to bring heavy rain, gusty winds and possible tornadoes to portions of South Florida Monday afternoon and night. The storm is then likely to continue strengthening as it moves into the eastern Gulf of Mexico Tuesday, before making landfall across the central Gulf Coast states Tuesday night. A Tropical Storm Warning was issued along the South Florida coast from Golden Beach to Bonita Beach, and for the Florida Keys from Craig Key to Ocean Reef, including Florida Bay. Tropical Storm Warnings are also in effect for inland areas of Collier, Miami-Dade and Monroe counties. A Flood Watch is in effect for those same counties through Monday evening. Copyright 2018 WUFT. To see more, visit WUFT.